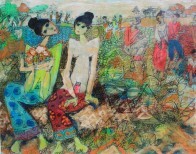 Born in 1939 in the picturesque city of Malang in East Java where he grew up and studied art. Bramasto was not only a very artistic person, he had an immense love for his native country. He travelled extensively throughout the island of Java, Bali and Lombok appreciating the endless riches of life in the countryside. This was evidenced in all his creation. Having dedicated fully to the development of fine art, he finally laid down his brush in 1996 at the age of 57. His work achievements entail numerous exhibitions at Indonesia's key art events between 1958 and 1996 which include a US-Indonesia joint-cultural exhitibion, a British Council's event and a Mon Decor's. Overseas exhibitions include a solo exhibition in Helsinky, Finland, participation in the Indo-Japan Fine Arts exhibition in Japan and an event at Galleria Taksu in Singapore.